Family St. Patrick's Day non-murder mystery party! 8-12+ guests, ages 13 and up due to difficulty. Great for families, church / youth groups, classroom parties, etc.! There are three kit sizes to this game (see below for details). Note: this game was updated on 1/9/18. 8-24 player game - 12 unique players and 12 duplicate team players as band members of Jade Nose and pixie dust factory workers. 8-40 player game - 12 unique players and 28 duplicate team players as band members of Jade Nose and pixie dust factory workers. Click here for the downloadable version of this game. 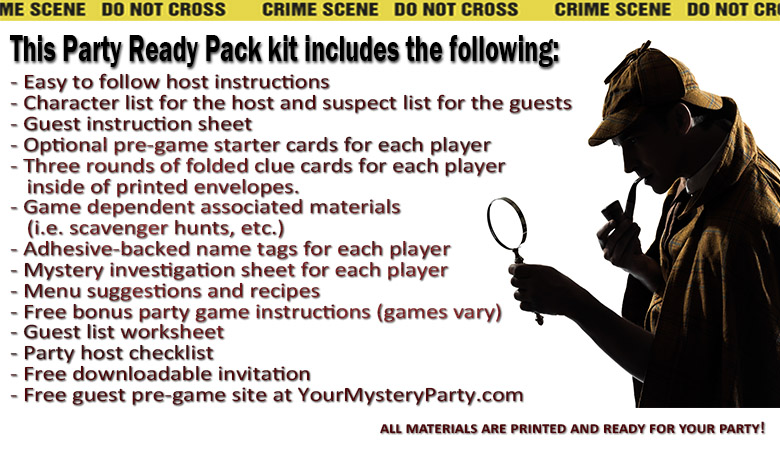 In addition to the fun St. Paddie's Day mystery party game, you'll receive free bonus party games. Games will differ between the instant download and party ready pack versions. Follow My Mystery Party's board Who Stole Larry Leprechaun's Pot O' Gold - Mystery Party (Non-Murder) on Pinterest.